The transition from military service to civilian life is not always easy. Many veterans experience a lack of purpose and feel they no longer have the level of job confidence or peer support they had while serving. Veterans Conservation Corps are particularly adept at addressing these challenges by allowing veterans to build on their military experience and ethic for service by training for careers in resource management. The Corps model benefits veterans in a range of ways: it provides a similar structure and sense of purpose as the military; offers the therapeutic benefits of getting outdoors and working with fellow veterans; and helps participants transition back to civilian life through skills development and other supportive services. The basic program model allows veterans to serve full-time for several months, completing conservation projects focused on wildfire protection, recreation enhancement, and habitat restoration. Corpsmembers receive training and certifications, are paid a living allowance, and, in many cases, receive a post-program AmeriCorps Education Award. Veterans Conservation Corps have been featured in several national news outlets, including The New York Times and CNN. 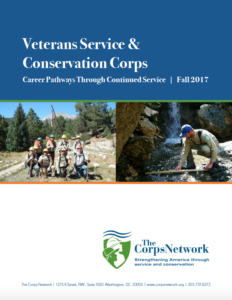 For more information, please view and download The Corps Network’s publication Veterans Service & Conservation Corps: Career Pathways Through Continued Service (November 2017).